this phone sure only for chienes..???? this phone only for chienes market...maybe not realease in another country? HDMI port is also not there..and hence comes with android 4.03...nw m running this official particular ICS in my neo v and iam totally unsatisfied with its performance,one of the most unstable OS i hv came across so far in android..and this one is too getting same ICS...what a bad idea aftrol......no way to buy this one Gingerbread is too user friendly...instead of giving ICS it should provide Gingerbread 2.3.7.. Doesn't it look like the Xperia PLAY? Shankychan, 08 Apr 2012Has anyone noticed that it still has the Sony Ericsson logo on the back?! Oops!They kept the original logo. But I miss Sony Ericsson. 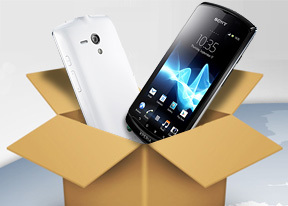 I would rather keep my Sony Ericssonn Xperia pro than upgrade to Xperia S with no card slot! Where is the new Sony Walkman "Z" series phone? Why is it not present on this website? phone is good .this is very expensive. AnonD-49356, 06 Apr 2012I do not know why Sony do not produce keypad phones working on android. Does anyone know that ... moreErm... Xperia Pro. Indeed, you do have a point though - the fact that you have not heard of the Xperia Pro is because many mobile network operators have ignored it, and shows just how out of touch network operators are with their customers. I really agree that most people would prefer true hardware QWERTY input like on the Xperia Pro if they had even heard of it or used it. Instead they are being sold touch-only devices, merely because that is what mobile network operators deem to be fashionable (I blame a certain rotten fruit company for this!). HD, 16 Apr 2012adreno 205 in 2012 (or maybe 2013)? Are u kidding?There is nothing wrong with Adreno 205 - not everyone want to pay £500 for a phone! adreno 205 in 2012 (or maybe 2013)? Are u kidding? i like this phone but it lacks fm which is not gud... i m confused either to buy arc s or neo l.
Has anyone noticed that it still has the Sony Ericsson logo on the back?! Oops!